Stitches: ch, dc, sl st.
Ch4, 2dc in 4th ch from hook. Ch2. (3dc, ch2) in same sp 3 times. 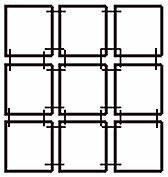 With Right Sides facing, using small lengths (about 3-4") of yarn, tack all of the squares together by tying knots through the corresponding ch2 sps on the squares. I tied the knots on both sides to make the coaster reversible. The lines on the boxes in the illustration show where I tied the knots. You can make this coaster like I did by using all colors of scrap yarns. 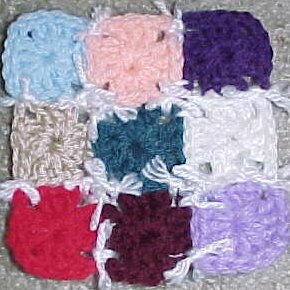 Or you can make a traditional nine patch square by using only two colors.